A trip to St. Augustine isn’t complete without exploring St. George Street. 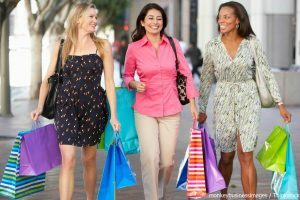 This pedestrian-only thoroughfare is home to some of the best shops, restaurants, museums, and more! Most of the spots along the street are locally owned, so you’ll be getting a genuine St. Augustine experience. 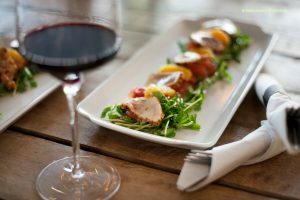 Whether you’re interested in learning about the history of the Nation’s Oldest City or you want to enjoy a delicious meal at a local restaurant, you’ll want to start at St. George Street in St. Augustine. If you’re interested in learning about more attractions around town, access our free Vacation Guide! Old City Gates: St. George Street starts at the Old City Gates, built in 1808 in order to defend the city. 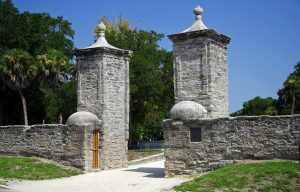 Today, the gates stand as one of the many historic monuments in town. 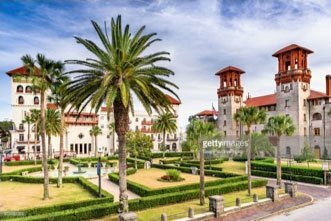 They are an iconic site in St. Augustine and are not to be missed! Oldest Wooden School House: Just like the names says, this museum is the wooden school building in the nation. Visitors are invited to explore the original building, as well as the tour the grounds, which include a sculpture garden! This is a fun way to learn about what life and education were like for early St. Augustine residents. Colonial Quarter: Experience St. Augustine’s past when you visit this living history museum! Colonial Quarter offers guests a chance to tour a house that is over 270 years old, watch a live musket demonstration, learn about blacksmithing, and get one of the best views of the water from the Spanish watchtower. While you’re there, be sure to stop by one of the two excellent restaurants onsite or shop for a souvenir at the Explorer’s Outpost. Pena-Peck House: The Pena-Peck House dates back to 1750 when King Ferdinand VI of Spain ordered it built for the Spanish Royal Treasurer. Once the city was ceded to Great Britain, the house changed owners many times. Learn the full history of this home and its owners when you tour the property! Serenity Blue: A newer boutique located on St. George Street, Serenity Blue offers an awesome selection of precious gem and sterling silver jewelry. Whether you’re treating yourself to a new piece or someone back home, this is a wonderful shop! Sunburst Trading Company: One of the more niche stops along St. George Street is Sunburst Trading Company’s Shell Shop. They carry all sorts of coral, shells, fossils, and more, as well as a line of jewelry and gifts. This is the perfect stop for a unique gift or souvenir to take back home. Saint Augustine Art Glass & Craft Gallery: Shop for stained glass, jewelry, and support American artists when you visit Saint Augustine Art Glass & Craft Gallery. Spanish Dutch Convoy: Are you looking for a beautiful leather bag or another new accessory? Head to Spanish Dutch Convoy. This cute shop has a fantastic selection of purses, jewelry, clutches, and more. Red Pineapple Boutique: Stop by Red Pineapple Boutique for a quirky gift or a cheeky koozie. Whether you’re looking for something to bring back home or a fun gift for a loved one, this is an excellent spot. Faux Paws: Get a present for your four-legged friend! Faux Paws is a locally-owned boutique carrying fun outfits, toys, treats, and doggie essentials. The Pirate Store: If the pirate’s life is for you, there’s no better place than The Pirate Store. They carry costumes, replica weapons, headwear, leather goods, and all the treasures you could wish for! If you’re interested in more pirate-themed attractions, head to the St. Augustine Pirate and Treasure Museum, a great kid-friendly spot that outlines the history of pirates in our city, as well as a collection of over 800 artifacts! The Prohibition Kitchen: This gastropub is themed after the Prohibition-era in America, with moody lighting, live music, and an impressive menu of upscale bar foods. The executive chef, Bradford Smith, utilizes fresh and local ingredients to create unique and delicious delights. Sample local oysters or any of their craft burgers while you’re there. Top your meal off with a handspun milkshake (which can come with or without alcohol) or a cast-iron dessert. Tedi’s Olde Tyme Ice Cream: Are you craving something sweet and refreshing? Head to Tedi’s Olde Tyme Ice Cream. This store, which is the oldest ice cream shop in St. Augustine, is a staple in town and features creative flavors that are sure to delight. The Spanish Bakery: Styled after a classic European cafe, The Spanish Bakery represents so much of St. Augustine’s history with its stone hearth oven, smokehouse, and Spanish-style roof. Their menu includes classic empanadas, picadillos, as well as delicious salads, soups, and sandwiches. If you’d prefer something sweet, check out their selection of turnovers, cookies, or scones! Colombia Restaurant: Visit the oldest restaurant in Florida! Columbia Restaurant is a must for any first-time guests to the area. Their menu includes classic Cuban and Spanish dishes, like gambas al ajillo, bilbao, or paella. Enjoy a glass of sangria or a mojito, which is one of Florida’s most popular cocktails. Be sure to save room for dessert! Mi Casa Cafe: For a laid-back experience where you’ll feel at home, visit Mi Casa Cafe! This beer and wine garden has an outstanding selection of beverages, as well as a menu of tacos, salads, and vegetarian options. Dream Boat Coffee: If you need a pick-me-up, head to Dream Boat Coffee to enjoy a delicious cup of cold brew or an ice cream cookie sandwich! 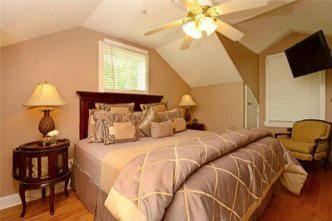 If you plan on exploring St. George Street in St. Augustine, there’s no better place to stay than Agustin Inn. Our historic bed and breakfast is centrally located in the downtown district, just steps away from this popular thoroughfare. 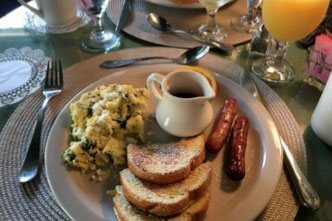 With stunning guest rooms, convenient amenities, and a delicious daily breakfast, it’s no wonder that so many visitors have chosen to return to Agustin Inn. 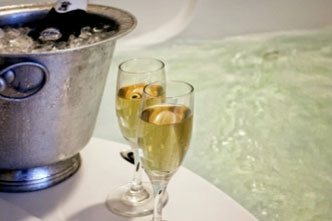 Let us become part of your next vacation!